matsuli music: Made in Dakar? "This is the latest chapter in one of the world’s most heartwarming musical stories – the saga of a group of musicians who have wowed audiences in stadiums, festivals and concert halls around the world, but who have retained the warmth, the spontaneity and essential humanity of the truly local band." 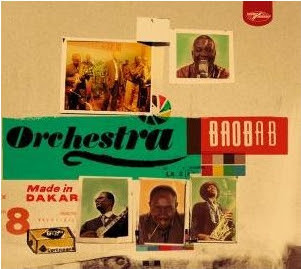 Made in Dakar is wonderfully recorded and sounds great - Jerry Boys' production is always top notch. I'm also seeing them on tour in the UK in late November. But knowing the old recordings which I've come to love and adore its hard to get truly excited. I really wish I was there first time around. I'm with you. I'd be more than thrilled if this gets them more fans, but I'm not going to stretch myself to get this one. Of course, Specialist was nearly a 'new recordings of old songs' as well. They're still great live, and unlike so many of their contemporaries they have managed to avoid "synth-ization" in their later years. Enjoy the show! "I really wish I was there first time around." we still have the old records to enjoy and live the band is still full of magic - i am really looking forward to this record! is there a reason the links are not working? FYI - Harare, the London based Zimbabwean dance band is playing at our party Manifesto in London on the 25th of September at the Burlington Club. It should be really good. I have booked a ticket for the show in Stockholm and was very excited by that. (I have not seen them live yet.) Now, I'm really excited by a new album too. "synth-ization" is part of what has made african pop music vital into the 21st century. we can't expect artists in certain regions to stay the same while others i the rest of the world evolve. obviously this process is complex but i think it's unfair, and ultimately futile, to hope for all music from africa to remain acoustic. The original LPs used electric instruments, but I do understand your point. Ibrahim Sylla has argued at length on this point. It also comes up again and again in the UK with the rift between the World Music crew and the Africans living abroad. Interesting that Baobab were originally considered a "hotel" band playing for politicians and the rich elite. I've been listening to this new LP for around 2 weeks and I've got to say that my initial reaction was harsh and slightly ill-considered. I understand, thanks for responding. this is definitely an argument that will not go away soon. i just listened to the record today (had one sent from the uk) and i think it sounds great. just happy there are still records like this available to a wider audience. glad you listened again! I have eight of the CDs and all but two vinyl recordings, and four cassettes. I am definitely going to get Made in Dakar, in fact I have already pre-ordered it. Even though Specialist in all Styles was essentially all reworking of old material, I enjoyed the new take on the songs and the modern production. The old recordings on vinyl or CD leave a lot to be desired. Also the new CD has 5 new songs. I like the new record a lot. But sometimes a song heard on an old radio or gramaphone in glorious lo-fi can have substance beyond the commodity that music has become today.